Popular maths writers have it much harder than authors of popular science books. Pretty well everyone loves science at junior school, even if they're put off it in their teens, so for science writers, it's just a matter of recapturing that childhood delight in exploring how the world works. 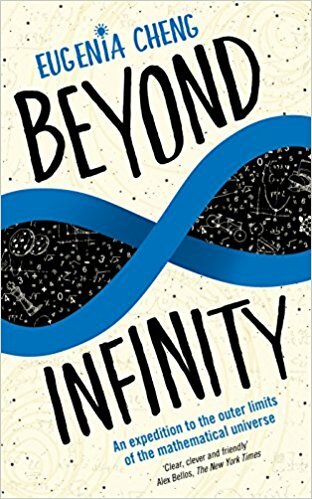 But, to be honest, maths is a relatively rare enthusiasm at any age, so the author of a popular maths book has to really work at his or her task - and this is something Eugenia Cheng certainly does, bubbling with enthusiasm and trying hard not to put us off as readers as she explores infinity. In Cheng's earlier book, Cakes, Custard and Category Theory, food played too heavy a role for me - here that tendency reigned in, though it still rears its head occasionally. We get a quite detailed exploration of infinity, infinitesimals and some additional material such as infinite dimensions and infinite-dimensional categories (we had to get some category theory), plus the usual enjoyment of quantum weirdness. 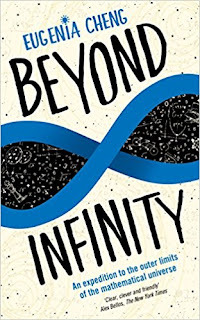 I felt sometimes, because the book doesn't build on a historical basis, we were thrown in at the deep end a little too early with assertions like infinity+1=infinity and infinity x infinity = infinity. The process where Cheng shows us how infinity can't be a real number, or an integer, or a rational fraction etc. also felt a little repetitive and drawn out. There's always a difficulty in letting go a little when you work in a field that requires total precision. But we never lose Cheng's enthusiasm and light touch. I think this book will particularly appeal to a reader who already has an interest in maths, but not much training, because it is purely focussed on the mathematics itself. For the more general reader, I suspect a book like A Brief History of Infinity, which gives historical context, brings and people and social implications to frame the maths, would work better as an introduction. With the appetite whetted, though, they should be encouraged to go onto Beyond Infinity, which as a wider mathematical context. I really enjoyed this book, and though the author's desire to include food did still slightly intrude - and I felt it was just a bit too much about her, rather than the maths - it's a great addition to the relatively sparse popular maths shelf.